It’s time to aggregate the Cyber Attacks Timelines of June (Part I and Part II) into statistics. So, as usual, let’s start with the Daily Trend of Attacks chart, which shows quite an irregular trend with a sharp peak on the 11th. The Motivations Behind Attacks chart confirms once again Cyber Crime at number one with 65% of occurrences. Overall the values are almost specular to the previous month. Particularly meaningful is the 11% of operations motivated by Cyber Espionage. The Distribution Of Attack Techniques chart shows a 27.4% of unknown attacks, a result in line with the previous month when this value was 26%. The rise of DDoS is another interesting aspects (this technique is increasingly used to blackmail victims), as also the 9.7% of targeted attacks, a relatively high value for this class, and, again, in line with the previous month. 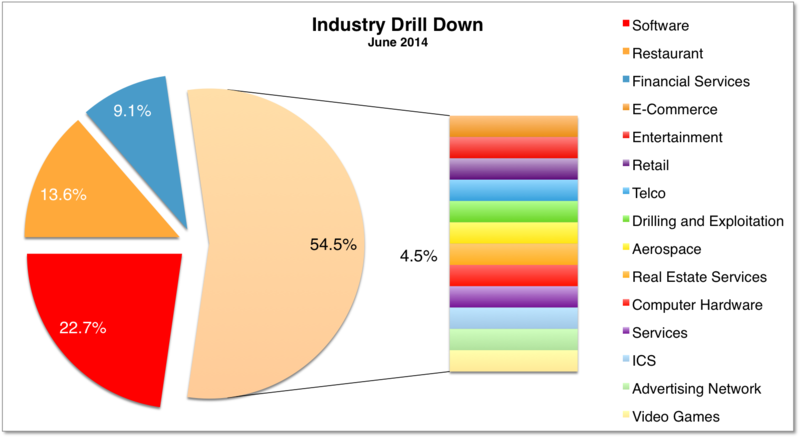 Once again, Industry leads the Distribution of Targets Chart with 35.5%. Governmental targets rank at number two, close to 20%, well ahead of Organizations at number three with a modest 6.5%. Drilling down the Distribution of targets belonging to industry, shows quite an heterogeneous landscape. Software industries lead the chart with 22.7%, followed by Restaurants (??) with 13.6% and Financial Services (9.1%). All the other categories are well behind with a “flat” 4.5% each.